Italy Tour Operator - Italy Escorted Tour, Discover Carnival of Viareggio and Cento. Arrival to Bologne airport and private transfer to the hotel 4* in Bologne, dinner and overnight stay. Breakfast at hotel , meeting with a local guide and visit to the art and culture city, located in the heart of the Po Valley, at the foot of the Tuscan-Emilian Apennines. It is called the "Fat" for its rich gastronomy and the "Dotta" because it hosts the oldest Western university. The heart of the city is Piazza Maggiore, the Basilics of St. Petronio, but its medieval old town is of considerable interest for its arcades, long nearly 40 km, the Neptune fountain by Giambologna and towers, including the world-famous Tower Asinelli and its unfinished twin, the Garisenda. Lunch with typical food. Return to the hotel, dinner and overnight stay. Breakfast at hotel and departure for Cento to see the famous Carnival of the city. This carnival has historical origins, since 1615 but today it is twinned with the Carnival of Rio de Janeiro. The parade begins in the early afternoon and crossing the historic center several times, accompanied by music and dancing figures in mask, while the Carnival’s Patron emcees the goings-on in Piazza Guercino, location for the main stage. 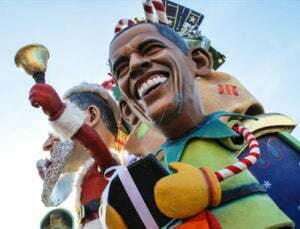 Characteristics of Cento’s Carnival also include the launching of inflatable and plush objects during the parade: locals know it as "the gettito". Lunch with typical foods. Return to the hotel, dinner and overnight stay. Breakfast at hotel, departure for Ferrara. Guided tour of this art city with a glorious past. it is possible to discover it on foot or by bicycle, getting lost in its magical atmosphere. 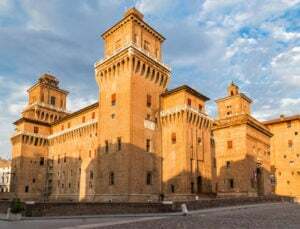 The Estense Castle is considered a monumental symbol, but there are also another interesting places to be visited like Palazzo dei Diamanti, Palazzo Massari and Palazzo Schifanoia, the Romanesque-Gothic cathedral, with the Loggia dei Merciai, occupied by artisans' workshops since the Middle Ages and the Monastery St. Antonio in Polesine. Lunch with typical foods. Return to the hotel, dinner and overnight stay. 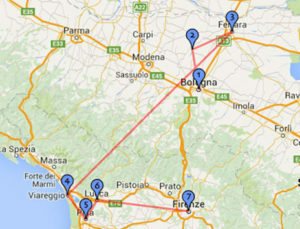 Breakfast at hotel, full day in Viareggio with free time to enjoy the Carnival Parade. Lunch in a restaurant. Accommodation in hotel, dinner and overnight stay. 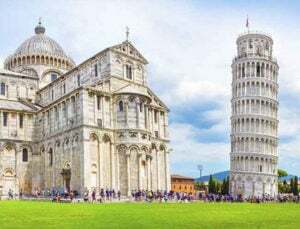 Breakfast at hotel, meeting with our local guide in the hall of the hotel, departure by private bus for Pisa to visit the famous Piazza dei Miracoli, with the celebrated Leaning Tower, the Baptistery and cathedral. Lunch in a typical restaurant. During the afternoon excursion to Lucca the elegant and refined tuscany town, where you will discover its charme walking along its famous sixteen century walls, then entering into the enchanting historical centre you will have the chance to admire the amazing Piazza Anfiteatro, the Torre Giunigi, the Duomo di San Martino and the typical "antique dealers’ street". Return to the hotel for dinner and overnight stay. Breakfast at hotel, meeting with the local guide in the hall of the hotel, departure by private bus to visit Florence city centre. Visit to: the Academy to see Michelangelo’s David and the Prisoners; the Cathedral Square, unique complex of buildings (Duomo, Baptistery and Bell tower; the Baptistery, one of the city's most ancient religious buildings; the beauty of its doors moved Michelangelo to call them “the Gates of Paradise”! 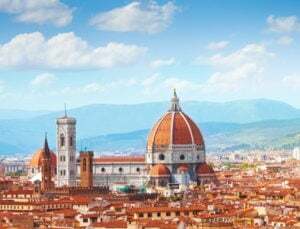 We continue the visit with the main square, Piazza Signoria, the Palazzo Vecchio (the Old Palace), the Uffizi Gallery, with its unrivalled collection of Renaissance art. Lunch and walking tour along the Arno River to admire the famous Ponte Vecchio, the only bridge on the Arno that wasn’t destroyed in World War II. Continue the visit with the Franciscan church of St. Croce, known as “the Pantheon of the Italian Glories”, because there are so many monumental tombs of great personalities of the past such as Michelangelo, Galileo Galilei, Machiavelli, Rossini. At the end you can relax with free time in a shopping area. Accommodation in hotel, dinner and overnight stay. Breakfast at hotel and departure by private bus for Florence airport.